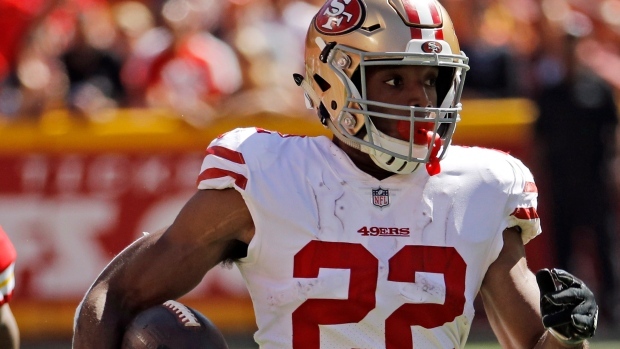 SANTA CLARA, Calif. — San Francisco 49ers running back Matt Breida is questionable for Monday night's game against the Green Bay Packers because of shoulder and ankle injuries. Breida was limited in practice on Saturday and will be a game-time decision at Green Bay. He is sixth in the league in rushing with 369 yards. The 49ers will be without rookie receiver Dante Pettis for a second straight week because of a knee injury. Receiver Trent Taylor didn't practice all week because of a back injury and is listed as doubtful. Receiver Pierre Garcon (shoulder, knee), tight end George Kittle (knee), guard Mike Person (knee), centre Weston Richburg (knee), tackle Joe Staley (knee) and cornerback K'Waun Williams (illness) are all questionable.